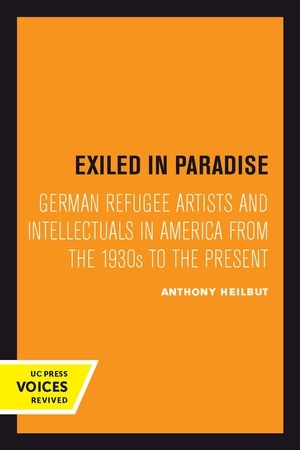 A brilliant look at the writers, artists, scientists, movie directors, and scholars—ranging from Bertolt Brecht to Albert Einstein, Hannah Arendt, Thomas Mann, and Fritz Lang—who fled Hitler's Germany and how they changed the very fabric of American culture. In a new postscript, Heilbut draws attention to the recent changes in reputation and image that have shaped the reception of the German exiles. This title is part of UC Press's Voices Revived program, which commemorates University of California Press’s mission to seek out and cultivate the brightest minds and give them voice, reach, and impact. Drawing on a backlist dating to 1893, Voices Revived makes high-quality, peer-reviewed scholarship accessible once again using print-on-demand technology. This title was originally published in 1983 with a paperback in 1997. Anthony Heilbut received his Ph.D. in English from Harvard. He has taught at New York University and Hunter College, and is author of The Gospel Sound and Thomas Mann: Eros and Literature. He is also a record producer, specializing in gospel music, and has won both a Grammy Award and a Grand Prix du Disque.